One of the images that my clients wanted was a cupcake...well of course I have about 200 cupcakes to choose from *okie wonders if she exaggerates a little at times* but I wanted something new so I got to work with a clipart image and came up with a new cupcake cut for their cards. I fell in love with the fluffy looking frosting on this one. I try to keep the cards fairly simple because I really don't trust my lack of patience in trying to help 6 people in putting cards together. One of the options they had this time was using either side of the double sided cardstock on the card mat, which by the way they do know what it is to mat a card now! LOL Most opted for the words but a few opted for the polka dot pattern. 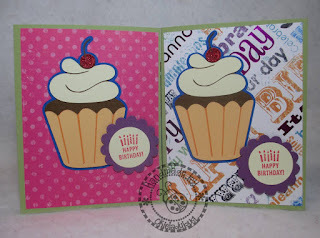 They used the Stampin Up scallop punch and then I punched out the sentiment they stamped. The inside of the card has "celebrate one cupcake at a time". This card is adorable. My Granddaughter turned 4 in May and all she wanted wa cupcakes and kids or her birthday. This card would have worked great. Very cute cards love the cupcake tfs! Thank you so much!! I figure out how to download your files! I'm so excited! Another really cute card, tfs! Great colors! Love the cupcake and the card, too! TFS!